Robbie Henshaw could make a surprise switch to full-back for Ireland's Guinnes Six Nations opener against England on Saturday. Ireland's unprecedented midfield depth and possible ring-rustiness for fit-again full-back Rob Kearney could tempt head coach Joe Schmidt into deploying Leinster centre Henshaw at number 15. Boss Schmidt is understood to be seriously weighing up handing Henshaw just a second-ever Test cap at full-back, with the 25-year-old having started his career in the role. Henshaw and Garry Ringrose have forged Ireland's latest prestige centre pairing, and yet Bundee Aki excelled in midfield against birth nation New Zealand in November's stunning 16-9 win over the back-to-back world champion All Blacks. Bullish Connacht centre Aki could slot in at inside centre to reprise his midfield combination with Ringrose then, allowing Henshaw to shift to the back-field. That re-jig would allow Schmidt to deploy three of his chief talents, should the hugely-dependable Kearney be deemed not quite ready for Test action despite recovering from thigh trouble. 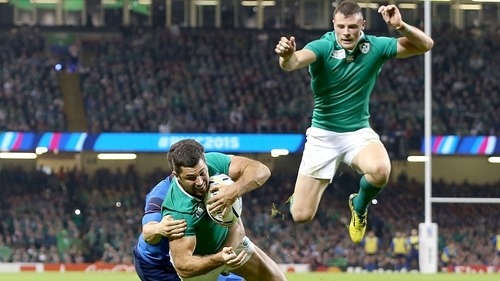 Schmidt insisted he had no plans to move Henshaw to full-back during Ireland's autumn run, where Kearney excelled in the 15 shirt in the All Blacks win. Ireland's Kiwi boss proclaimed "When they are all fit I'll let you know; I'm not sure myself at this stage" when quizzed in November on quite how to shoehorn all that midfield talent into one XV. That time has finally arrived, with Schmidt giving serious thought to selecting Aki, Ringrose and Henshaw in the same starting line-up. Johnny Sexton completed his recovery from knee tendon issues last week, and assistant coach Simon Easterby sees precious few issues on parachuting in the world player of the year. "I think certain players need game on game to get back to a certain level but Johnny is probably not one of those," said Easterby. "He has the ability to play fresh as it were, to run a team, know his detail, be across everything but also feel like he's got that conditioning and fitness under his belt. "Yes, match fitness is probably second to none but I certainly think we trust the medics and the conditioners that have worked with him, not just in Leinster but here as well, and who have got the balance right in terms of his work and the ability to get him back up to speed. "Certain individuals maybe need a bit more but I don't think Johnny is one of those." Aggressive flanker Sean O'Brien has proved his fitness, having recovered from the broken arm he suffered in the November victory over Argentina. The 31-year-old is another frontline star itching to jump straight back into Test rugby with precious little provincial action. Ireland's system allows players to peak for international endeavours though, leaving Stander confident his back-row colleague will have no ring rustiness whatsoever. Asked if O'Brien is fully primed for Test intensity, Stander emphatically replied: "Yes: he is one of those players who can pull on a scrum cap and jump straight back into the deep end. "There is a standard expected here of all the players; if you are selected you give 100 per cent for the jersey and I think he is a great man to do that."